1. Preheat your oven to 350F. 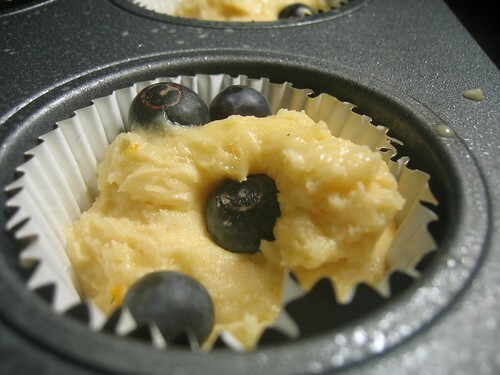 Using a non-stick spray, grease and coat muffin or cupcake pan. Add the paper or foil cups. 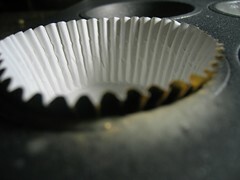 Note, if you are using cups, the greasing is simply an insurance should you have issues with run over. 2. In bowl, add the flour, salt, baking powder. Whisk together and set aside. 3. 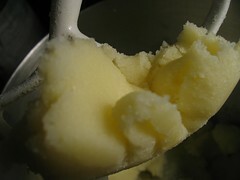 In the bowl of a stand mixer, add the butter and sugar. Cream them together by beating on medium speed for about 3 to 4 minutes, or until the butter has lightened in both volume and color and the sugar seems to be uniform throughout. Add the eggs one at time while mixer is on slow speed. Add the second once the first is fully integrated. Add the meyer lemon zest & juice, vanilla and heavy cream. Mix until everything is integrated. Remove the bowl and hand fold in the flour mixture until mostly integrated. 4. Scoop out the batter into the cups. 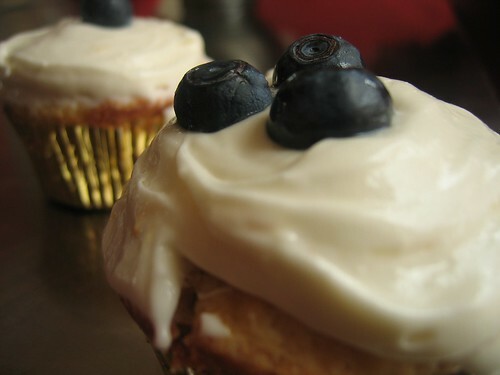 Press 4 to 5 blueberries into each dollop of batter. 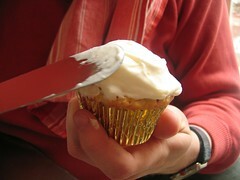 Bake for 25 to 30 min or until a tooth pick pulls clean from the cup cake. Let the cupcakes cool completely before frosting. 5. 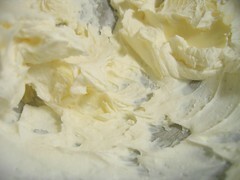 In the bowl of your stand mixer and using the whisk attachment, beat the cream cheese until fluffy and light. Add the zest and juice, vanilla extract, two cups of sugar. Beat until smooth. 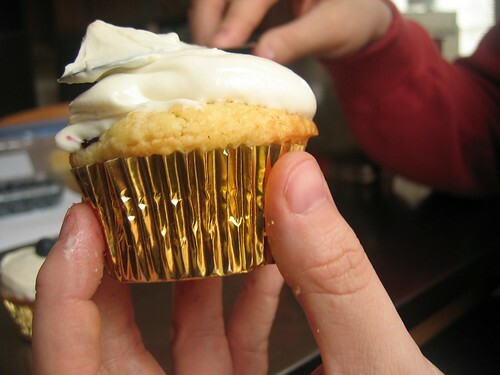 Add the remaining sugar ½ cup at a time until you get the proper consistency for the frosting. It should be thick but still pliable. Cover and refrigerate until ready to use. 6. Once the cupcakes have cooled completely. 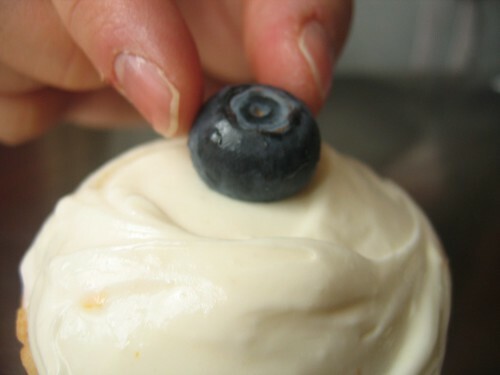 Frost by adding a large dollop to the top and center of the cupcake and then smoothing from the center by turning the cupcake in your hand and leaving the spatula or knife steady.. It should spread out from the top and out. 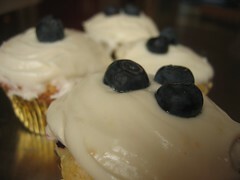 Once frosted, you can garnish with zest and blueberries. Serve to screaming masses. Enjoy! my name is Roger Bailargeon. I just started a New Blog at WordPress and I’m having fun looking at other Blogs that have postings in the same category that I’m in. I just took a drive around Your Blog and it sure was a nice trip. You did some nice work with the content and I really did enjoy it. Many congratulations! Both on the new son and stage of your lives, AND to the dear wife finally getting to eat sweets again! 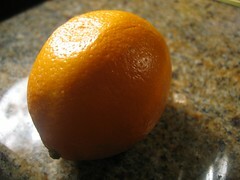 I can’t wait for a few more pictures of that wee bundle of joy to creep into the ol’ food blog. he is precious. Congrats on the non-blueberry tinted babe!! Congratulations. Jack IS perfect, isn’t he?! 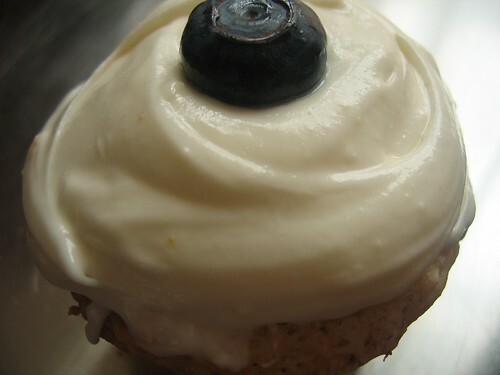 Your cupcakes are pretty darned near perfect too. You won’t be getting much sleep for a while, but you’ll have months and months to practice your cupcake-making skills before Jack can put them to the test. Good luck and good health to all of you. He looks fantastic! Congrats! Life is going on a wild ride now that is going to last forever, the greatest ride of your life with more highs and lows than you ever bargained for, or expect. Nothing other than parenthood can offer more contrasts; from brilliantly clear moments of pure, unconditional love, to tiny snippets of heart wrenching despair- the worst being Jack’s pending immune shots. Gawd! Keep the camera charged and your hearts wide open. It’s going to be great! wow! congratulations! that is very exciting! When he’s old enough to munch of solids, that’s going to be the most well fed kid EVER! Congratulations! He looks perfect. I have seen so many first pictures of friends kids where they are all splotchy and red, but he is perfect! Now go get some sleep while you can! What a cute sleepy little face! Congrats. Ooooh! He’s so adorable. I just returned to my desk after a company baby shower and thought, geez, they should be having their baby soon so I checked out your blog. Congrats on the new addition and good luck perfecting your skills for Jack! 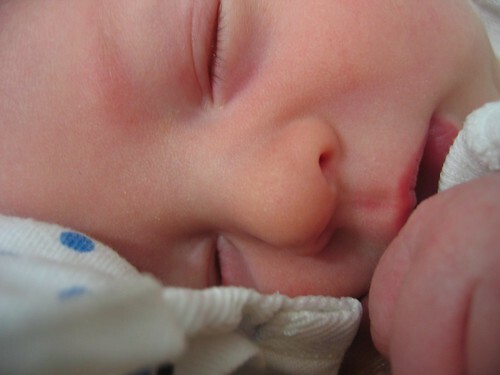 The baby is so adorable and beautiful. The cupcake is cute…but Jack is much cuter. Just PRECIOUS! I think you have your own little hairless cupcake. I hope you take a cupcake to your wife! Congrats and I look forward to many more pictures of your new cupcake! hooray! what delicious news. now i will look forward to your posts even more—as i always love to read about food and the ways in intertwines with parenting. congratulations to you both. he’s lovely. Many congratulations on your beautiful new little chef. He is very lucky to have parents who like to make sweets so much. Awwww. He’s gorgeous! Congratulations to you and the wife. Congrats! That is one fine looking boy! I bet he’ll be in the kitchen with you in no time. Congratulations on the birth of your baby boy! I am so happy for the two of you. May this be the start of many more blessings. wowee keflowee! Congratulations and best wishes for many, many more happy birthdays with gorgeous cupcakes to come!!! “wowee keflowee” – an expression I first read in a children’s book many years ago. I have been looking for the book for many years but no luck. Since you used the term, any possibility you know the book? Thanks. Oh, he is GORGEOUS. I’m so happy for you all. I have a six month old boy – also breech, they make the best babies! – and I get all super teary and sappy over all babies now. And yours is a corker! Happy Birthday Jack! 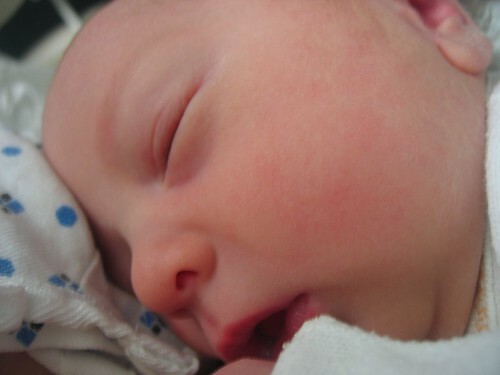 You are a gorgeous little one, welcome to the “outside.” Treat your parents well and let them get some sleep would you. (Oh yeah your not gonna know day from night for at least a few weeks, heck, everything looks upside down right now too) Anyway, eat well and grow so you can enjoy these yummy creations. Congratulations on the positively adorable baby! What great pictures! Congratulations and thanks for all the great recipes. It always inspires me when I see what others are cooking. Wow, do you two make anything that is not beautiful? Seriously. Congratulations. And Happy Birthday to Jack. They both look great, but as good as blueberries are, i’m rather partial to the little pink blob. Jack… good, solid name, that! Congrats to you both. aww, that’s great news – congrats to you both! Congratulations!!! Happy belated birthday to Jack. Congratulations! I am so sorry to be late in checking back here to find out about him! I want to kiss that bald little baby head and feel that soft face. He is lovely. A work of art. Just what I would expect from H and W. CONGRATS!!! what a beautiful baby! i love your blog (and gorgeous photography!). best of luck with your new addition! Congrats on you newborn! Precious pic. BTW, I tried the recipe. Everyone is just eating it up! 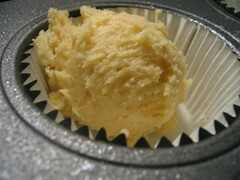 I think I mistakenly warmed the butter too much by the stove, so it ended up abit grainy and did not puff up like a normal cupcake. But it still tastes great. Thanks for the recipe. So I tried the recipe last night. Pretty freakin’ tasty. Is there a way to make the cupcakes more cake-like? I’m not sure if I simply didn’t mix enough air into the batter, but the cupcakes were a little more muffin-y than I’d like. The icing is AWESOME. And the whole thing was a big hit! Thanks for the sweets. Hi – I just found you looking for a lemon ricotta pancake recipe. Your baby is gorgeous and I really like your blog! Congratulations and thanks for the recipe! *My* little pink blob is almost three! I’ve saved this recipe for his birthday on the 14th October.